Th-INK-ing of You: Little Boys! Don't ya love 'em!!! I hope you had a wonderful weekend! I certainly did! Yesterday was my birthday and I was blessed beyond measure with messages, emails, drop in visitors bearing gifts and cards, and a special lunch after church with our kids. It was our first day back to church since my husband's health issue and it felt so good to be back in God's house worshiping together with our church family! There are some wonderful TV Pastors on TV , but nothing quite matches worshiping together with your church family! The dies are Spellbinders Lattice Pendant, Ribbon Banner, and Lattice Accents. and Classic Ovals Lg. The embossing folder is Crafts Two. I stamped the image with Versamark and heat embossed with Stampendous Pearlustre Sapphire embossing powder. Then I sponged over it lightly with soft sky and not quite navy ink. I tucked the Spellbinders classic circle into the lattice pendant and popped up the layers. I just love this sweet card Grace!! The blue silhouette and your sponging is perfect with your beautiful framing. The white edging with the embossing paired with the polka dotted paper makes the image pop. What an adorable card, Grace. 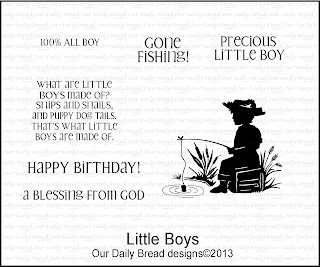 I am so bad about making boy/guy cards, but this is just SO sweet. Thank you for sharing your talents with us. It's always such a joy to have you play along. 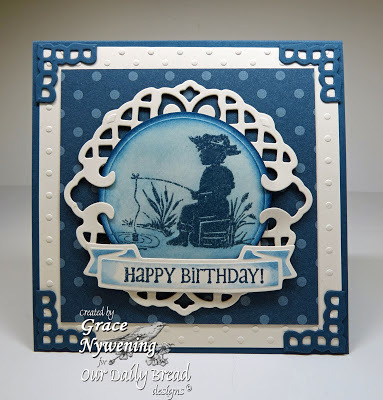 Love your adorable card and the blue is so pretty. Thank you for joining us at A Gem of a Challenge Grace, with your beautiful card. Love that image and the colours. Your work is always so precise and beautifully put together. I always look farward to seeing what you have put together. I'm delighted to see you are back with your church family. Aww Grace this is fabulous - love the way you kept to the blue and white and added so much texture. Glad you all are able to go church, nothing like live worship. A very happy Belated Birthday to you... so glad you were able to get back to church, it is always so special when we can worship our Lord with our church family. Wow, even with all the embellishments this remains truly a masculine card - wonderful! Perfect birthday card for my Amusing Challenges this week. Thanks for playing along!